When you’re trying to diversify your investment portfolio, it’s important to go beyond the usual options of stocks or bonds and consider new investment opportunities. There are many advantages to diversifying your portfolio. You’ll have lower risk thresholds, greater returns on investments, and potentially lower fees. What you invest in is just as important as who you invest with. A fund manager or investment platform with a poor history of returns could spell disaster for your portfolio. On the other hand, a successful company, platform, or organization could be tremendously helpful when it comes to getting the best returns on your investments. USAA-made ETFs are prime examples of new and promising investment options. The United Services Automobile Association offered one of the most innovative approaches to smart-beta ETFs, and the organization is highly experienced when it comes to fixed-income investment strategies. The USAA-made ETFs were initially offered in the public markets in October 2017. They’ve been extremely buzzworthy among investors ever since. Exchange traded funds function similarly to stocks in that they’re traded on the open market at all times. They differ from index funds because they comprise a variety of related stocks for investors to purchase shares. There are many niche ETFs available for investors to chose from. If you like the future predictions for a particular industry, you can likely find an ETF that specializes in it. There are other types of ETFs, such as stock ETFs, bond ETFs, currency ETFs, actively-managed ETFs, and smart-beta ETFs. If you’re curious about smart-beta ETFs, they’re particularly favorable for investors. They seek to maximize returns by analyzing unique market factors such as size, value, and volatility of stocks. They follow an index but operate as ETFs by accounting for other factors and fluctuating in price throughout the trading day. USAA offers insurance, banking, investment, and retirement planning options for members of the U.S. military, veterans, and their immediate families. Members receive an incredible array of financial services and discounts. These include benefits such as auto and homeowners’ insurance savings, free checking accounts, competitive credit card rates, consumer discounts, and investment options ranging from IRAs to CDs and annuities. USAA has been around since 1922. The investment side of USAA has about $75 billion in retail assets, with $1.1 billion in USAA owned and managed ETFs. USAA’s total assets under management (AUM) is currently close to $165 billion, which includes those retail assets of customers as well as assets from USAA’s insurance portfolio. Since USAA has a strong history of promoting financial independence for military members and veterans, it’s an ideal place to start investing for anyone with a military background and a desire to generate more income through investments. Changing careers? 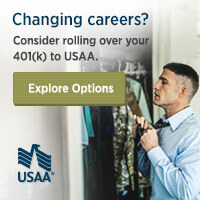 Consider rolling over your 401(k) to USAA. USAA has been a major investor in the ETFs market for several years. However, only recently did it request to bring out its own line of USAA-made ETFs. Previously, the ETFs market has been largely dominated by Vanguard and Goldman Sachs until now. USAA currently offers four equity ETFs: USAA MSCI USA Value Momentum Blend Index ETF (ULVM), USAA MSCI USA Small Cap Value Momentum Blend Index ETF (USVM), USAA MSCI International Value Momentum Blend Index ETF (UIVM), USAA MSCI Emerging Markets Value Momentum Blend Index ETF (UEVM). The equity ETFs are designed to simultaneously outperform market indexes and control for long-term risk. This makes these ETFs ideal options for investors seeking higher returns without taking on excessive risk. USAA also offers two fixed income ETFs. These are USAA Core Short-Term Bond ETF (USTB) and USAA Core Intermediate-Term Bond ETF (UITB). These “core” ETFs are based on USAA’s long-standing experience with managing fixed-income assets. ETFs, or exchange traded funds, are another type of investment vehicle similar to index funds. Exchange traded funds are like mutual funds, in that they hold a basket of stocks in a single fund for investors to purchase shares of. But, unlike traditional actively traded mutual funds which only reset their prices and execute orders at the end of the trading day, exchange traded funds trade on the open market at all times like shares in an individual common stock. As a result, they act more like a stock on daily basis with fluctuations that are the result of the real-time supply and demand for that investment at that given point in time. ETFs are similar to index funds in that a lot of ETFs mirror the market like index funds by only holding the exact same securities that comprise the index. But, you can also find ETFs that specialize in a huge number of other investment choices, sectors, commodities, and other specialized investment choices that you cannot find in an index fund. There are some great advantages of exchange traded funds (ETFs) that investors can use in their portfolio. Because of the way exchange traded funds’ shares are priced, you have more control over your investing and more options when buying and selling shares. Exchange traded funds’ characteristics that are different than traditional mutual funds can be beneficial to investors. An exchange traded fund is a type of security or financial investment that tracks a certain index of the stock market, commodity, or a group of assets much like the way an index fund operations. The one unique aspect of an exchange traded fund is that their shares trade much like a share of stock would trade. Unlike a mutual fund, the share prices for exchange traded funds constantly move with the stock market during the trading day. This is one of the great advantages of exchange traded funds. Mutual funds only adjust their share prices at the end of the trading day when all of their purchases and share selling has been complete. Then, their net asset values are recalculated and their share price is updated. Exchange traded funds continue to trade on the open market exactly like shares of stock. The share price moves in tandem with the supply of shares and the demand for those shares. When there is a high demand trying to buy those shares, prices move up immediately to meet that demand. The same happens when investors are selling and no one is there to purchase. Share prices immediately react by coming down until they can find a buyer in the marketplace. Exchange traded funds allow you to invest with the types of purchases that investors are familiar with through buying and selling stocks. An advantage of exchange traded funds is that investors are able to place limit orders and stop orders when buying and selling shares. Investing using limit and stop orders allows investors to have a much better control over the prices that they are willing to accept when buying and selling their shares of exchange traded funds. These are great tools to take your investing to the next level and are excellent advantages of exchange traded funds. Many mutual funds have high minimum investment requirements to open a new account. Most typically require investors to initially invest $2,500 or more to open a mutual fund account. Sometimes investors can get this requirement waived if they agree to open an account and fund it using a monthly direct deposit each month from a linked bank account. While this is a great way to dollar cost average your investment, it may not be the optimal way to open a new mutual fund account especially if you have a large lump sum that you are trying to invest. Exchange traded funds allow you to purchase as few amounts of shares as you want and even fractions of a share much like you would a share of stock. And many ETFs also have a low minimum investment amount or even no minimums for initial investments. Are exchange traded funds for everyone? Of course, they aren’t. There are a few drawbacks to ETFs as well such as commissions and fees if you are purchasing a small number of shares or trying to dollar cost average. But, there are some great advantages of exchange traded funds as well that investors can benefit from also. Should You Invest in USAA-Made ETFs? USAA’s ETF selections are useful for investors who want to diversify their portfolios and take advantage of the latest market analytics provided by the smart-beta approach. The equity ETFs specifically evaluate two crucial factors. The first is value, which is the stock price in relation to a company’s cash flow and other fundamentals. The second is momentum, which are predictions about a company’s stock going up or down in value. By combining years of investment management experience and top-notch technologies, USAA is set to revolutionize the ETFs market. You can trade USAA-made ETFs through any brokerage account. But, one of the greatest benefits of having a USAA brokerage account is the availability of commission-free ETFs. This allows investors to focus on getting the best returns without worrying about racking up fees. The organization’s 11+ million members and an extensive history of successful portfolio management suggest it will be quite the powerhouse in the ETFs market for years to come.